I managed to come away with quite a decent haul of sample sized products which she didn't mind me trying out. 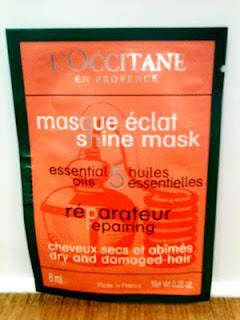 One of them was the L'Occitane Masque Éclat Shine Mask for dry and damaged hair, which I tried out this evening. My hair has been feeling a little parched due to the change in water types over the weekend (London has much 'harder' water than up here in Leeds), so I decided to give it a little treat. This hair mask contains 5 essential oils (although it doesn't tell you which ones) and sunflower and wheat oils and claims to 'nourish, deeply restore and protect' the hair. My hair isn't even fully dry yet and I already love this stuff. I may have to add it to my wish list - in fact I'm definitely adding it! It smells so good - lavender and a hint of lemon I think. My hair feels so soft and smooth and I can already see that it looks shinier even though it's still a little damp! Magic. The sachet gives instructions to use the mask twice a week, but I have quite long hair so there was actually only one usage in there for me, but you might be able to squeeze another use out of it if you have shorter hair. The sachet also says to leave it on for 5 - 10 minutes and I think I left it on for around the 10 minute mark as I like to leave things to really work for a while - feels like you're getting more of the benefits somehow. I put this on wet hair and combed it through before tying my hair up loosely and leaving it to get to work. I am seriously recommending this if your hair is feeling a little dry, so lovely to use. The consistency is pretty much just like a conditioner which is on the thick side, the smell is heavenly and the results are amazing. Instantly a new favorite of mine.